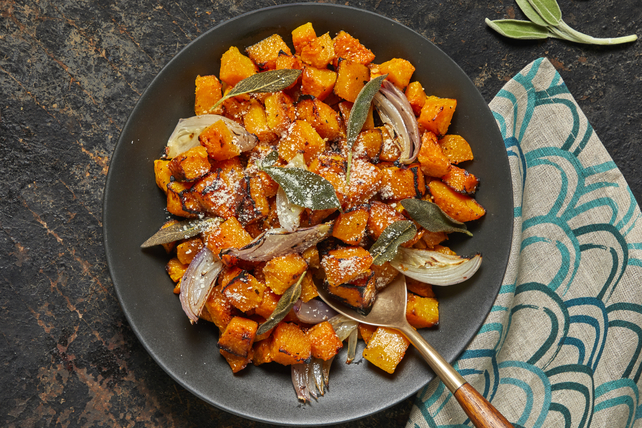 Celebrate the flavours of the season, and make our Roasted Butternut Squash with Sage recipe. With just six ingredients, our Roasted Butternut Squash with Sage is a sweet and savoury side dish that's packed with flavour! Cover rimmed baking sheet with foil; spray with cooking spray. Peel squash; cut lengthwise in half. Scoop out and discard seeds. Cut off and discard both ends of squash. Cut trimmed squash crosswise into 3/4-inch-thick slices, then cut each slice into 3/4-inch chunks. Spread onto prepared baking sheet. Add dressing, shallots and 2 Tbsp. cheese; stir. Roast 30 to 35 min. or until squash is tender, stirring after 20 min. Remove from oven. Melt butter in small skillet on medium heat. Add sage; cook and stir 2 to 3 min. or until crisp. Serve squash topped with sage and remaining cheese. Use an ice cream scoop to remove the seeds from the squash halves. Because the edge of the scoop is sharp, it cuts through the fibres inside the squash easier than if you used your hands or a regular spoon.